What's more impressive than sharks with laser beams? Dolphins with nuclear missiles. And that's the newest member of Israel's navy. A Dolphin-class submarine, anyway. 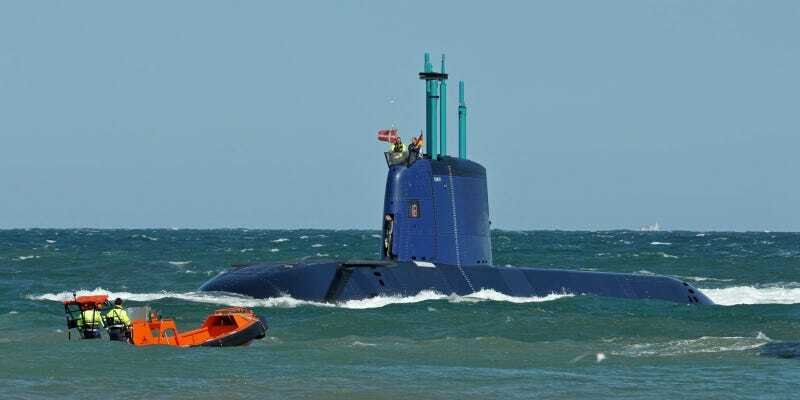 Christened the INS Tanin, this Dolphin-class submarine is both the largest sub produced by Germany since WWII and the most expensive vehicles owned by the IDF. It's also widely regarded as among the most sophisticated, stealthy, and effective conventionally-powered (i.e. non-nuclear) submarines on the the planet. The Tanin, which is just the fourth submarine in Israel's fleet, is an example of the slightly larger, slightly newer Dolphin 2 design, measures 225 feet in length with a 22 foot beam and 20 foot drought. Three diesel-electric motors generate 4,243 shp apiece, giving the Tanin a top speed of 25 knots underwater. A compliment of just 35 crewmen is all that is needed to operate the vessel. What's more, it's outfitted with an advanced air-independent propulsion system. See, the until the advent of nuclear propulsion, submarines could only hold their breath (quite literally) for limited amounts of time. Their diesel engines required oxygen to run and once that supply ran out, the engines died. AIP technology, conversely, works like a hybrid car. Diesel engines recharge massive Li-ion batteries that power a silent propulsion system which is not limited by the need for oxygen, only by the capacity of the batteries. And while the mascot isn't exactly terrifying, these dolphins pack a punch. They're equipped with room for up to 16 torpedoes and cruise missiles. Four enormous 650mm tubes can be used for anything from subsea mines to special forces infiltration vehicles. More importantly, these tubes can launch SLCMs (sub-launched cruise missiles)—like the Popeye—which are capable of travelling more than 900 miles and are rumored to have been outfitted with 440-pound nuclear-tipped warheads. This would offer Israel a potent first strike capability as well as serve as a doomsday backup, giving Israel a chance to counter from offshore any inbound nuclear attack—sort of a way to just make things worse for an entire planet already enveloped in thermonuclear war. "The submarine will amplify the capabilities of the IDF and the State of Israel's strength," Lieutenant General (res.) Ehud Barak, Israel's Minister of Defense, said during a press conference in 2012 during the initial purchase of the vessels from Germany at a cost of $1.27 billion. "The Navy has undergone strategic changes over the past few years that place it at the forefront of the battle over the safety of Israel, as the long arm of the IDF. The agreement reflects the strong relations with Germany and the German government's commitment to Israeli security."